I have a mantra that I’ve always stuck to when it comes to food: the smaller the joint, the better the chow. And around my area, when it comes to the Real Good Dog, places don’t come much smaller or much better than Windy City Eats in Weymouth. Windy City Eats is small enough to hide itself between Donut King and a cigs-and-lottery store somewhere close to the middle of nowhere–Middle St. in Weymouth, matter of fact. I think that if it wasn’t for the vibrant red and yellow Vienna Beef umbrellas, it would be nearly unfindable. Or at least extremely easy to overlook–which would be a mistake. Let’s back up a moment, to show you why: Vienna Beef. Windy City Eats. The pattern is clear. Yes, it’s run by a transplanted Chicagoan who has dedicated himself to educating us East Coasters on the fine art and sheer quality of Chicago style dogs. 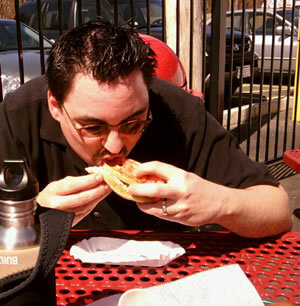 Which is not to say he only offers the classic Chicago dog–he’s got it, of course, but you can get your dog on any number of ways here. But the dogs are only Vienna; the buns are soft poppy seed rolls…made by Vienna. The relish is that gloomy green color…made by Vienna. And as far as small goes, well, eating at Windy City is like eating in a hallway. A clean, pleasant hallway with very good food, but a hallway nonetheless. See the cooler in the right hand side of this picture? That’s against the wall. If I had about six more inches of wingspan I could stand in the middle and hit both sides. Five people make a crowd in here, and it’s always crowded. 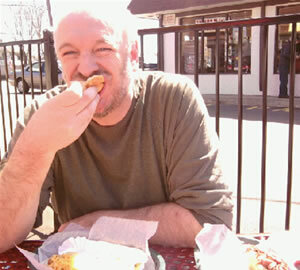 Now, Milkbone is a worldly man by all accounts, but he had never experienced the wonder of the Chicago hot dog. So he wasn’t getting away from here without one. 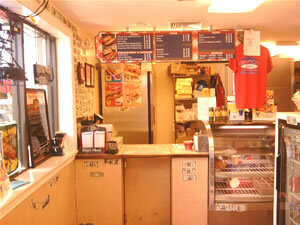 He was game for that, but he’d also scanned the menu online in preparation and was tempted by the call of the corndog. 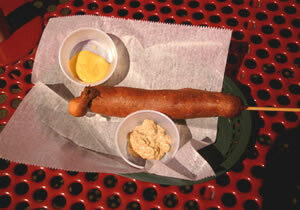 (As we will see in a moment from its photo, there’s a good chance the corn dog’s call was actually a mating call.) 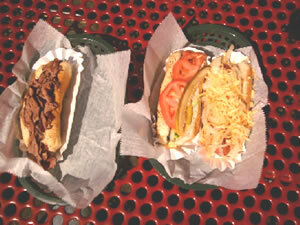 As for me, it was going to be a Chicago followed by my favorite–the Navy Pier dog. There are many ways to self-induce a heart attack, and one of them is to pile a third of a pound of pastrami onto a hot dog. Add spicy mustard and you’ve got yourself a Windy City Eats Navy Pier. And a new religion. Let it be known that on most occasions I am a three-dog man–and this time was no exception. I rounded out my balanced meal with a Bob Dog: sauteed onions, bacon, cheese and BBQ sauce. There’s the lineup: Navy on the left, Chicago in the middle and Bob on the right. They sell good, honest dogs here. All beef, with a nice snap. The toppings, especially on the Chicago, are fresh and plentiful. The poppy seed rolls are steamed perfectly, just to the proper side of that point where they get a little too soft and take on that weird hint of sliminess. The dogs run from just under $3 to a shade over $4 a throw, and they’re worth it. They build ’em right at Windy City. Pure classic style with the Vienna relish, onion, mustard, celery salt, a pair of fresh tomato slices, the sport peppers and that ever-lovin’ pickle spear laying like an exclamation point across the top. I’ll give you a moment to let the image sink in. And then another moment to let you make an appointment with your therapist to get the image back out of your head. We decided that something like this, something so… I dunno…anatomical… needed a name. Technically, it’s a spicy corn dog. We called it Bubba. I have refrained from posting a photo of Milkbone bringing Bubba up to his mouth as this is the first time you’ve met the guy and it could irreparably harm his reputation. Plus, it would make his daughter cry. All in all, what it came down to was that we spent an hour hanging out in the much-needed sunshine, gorging on some of the best hot dogs served up locally. 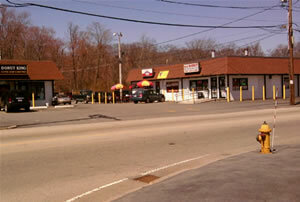 The owner is a great, pleasant guy who aims to please and consistently hits the mark. Windy City Eats is definitely worth hunting out. The smaller the place….. Excellent! Glad that you guys included the requisite stuffing-your-face photos! Great to meet you this weekend John! I don’t know about anyone else, but I grew up in Detroit with Coney dogs. They’re definitely the best in my opinion! Milkbone, I’m a little worried that you “miss” the dog. You haven’t been staring longingly at the picture of it, have you? Obsessively re-visiting the site, or perhaps just stumbling upon it again and again “accidentally”? At least you didn’t have to watch him eat it.